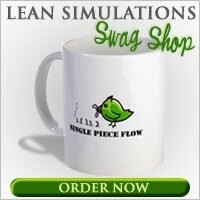 Lean Simulations: The 5S Shapes Game - What's Missing? The 5S Shapes Game - What's Missing? A Japanese trainer eloquently presents a lean 5S game in the following video. Lean 5S games differ a little from typical lean push vs pull games, since 5S focuses on organization, visual controls and standardization. In many of these 5S games, a team sorts through a large group of items, trying to find specific things. Timing this activity shows the benefit of an organized work space. The more organized the work station, the quicker it will be to find what you need, and you can easily see if anything is missing. The 5S Numbers Game is one of these types of 5S games that doesn't require any special equipment. "Shapes are laid out on the paper. When you come in, you don't know what I took." "If things are laid out randomly, you wouldn't know. If we do it our own way, we'd have many answers." "Laid out this way, it says triangle, it says 4 triangles, we know when he steals one." "We know if it's OK or not OK right away." "If there's no spot for something, we know we're not supposed to keep it there, we have a problem." Provide a large pile of mixed shapes. Hand out a list of mixed shapes. This list is a subset of the above items. Each team finds the shapes from the list. Compare times and generate some discussion. Allow each team to organize their pile of shapes in advance. Hand out a new list of mixed shapes. Compare the teams and try to understand the benefits of organizing. As well, identify if any teams did things differently and what the effect was. Take the items from the second list (the subset of shapes) and organize them clearly and logically on the table. Now get all teams to leave the room. Jumble up the items on each work station, take a few away and add a few new items. Call the teams back in and ask them to re-organize their stuff. Ask them: Is anything missing? How do you know? Make sure each team has a large piece of paper to write on, so they can create shadow boxes for each item. A 5S game can be done with almost any group of items. Some people use things that are a bit more relevant, like a tool box, or a bunch of office supplies. It all depends on how you want to run it and the space you have to work with. The 5S shapes game uses little coloured shapes, but you don't have to. The light bulb goes on when you finish round 3. That's when people really start to get it. 5S is not just about cleaning up. Each team has just set up all their stuff in a logical fashion, then you go and mess it all up! Was their set-up clear enough to ensure that they could figure out what was missing and how many? Has anyone else run or joined in a similar 5S game? Was the sequence similar? I've added this 5S shapes game to my list of lean games and simulations. 5s game sounds like a fun game to try.